Josh Hamilton was the first player chosen in the first round of the 1999 baseball draft. He was destined to be one of those rare "high-character " superstars. But in 2001, working his way from the minors to the majors, all of the plans for Josh went off the rails in a moment of weakness. What followed was a 4-year nightmare of drugs and alcohol, estrangement from friends and family, and his eventual suspension from baseball. BEYOND BELIEF details the events that led up to the derailment. Josh explains how a young man destined for fame and wealth could allow his life to be taken over by drugs and alcohol. 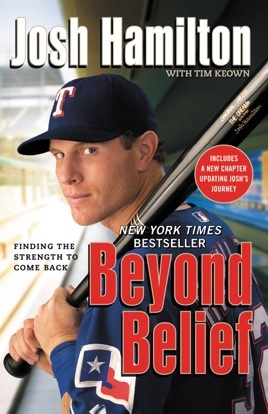 But it is also the memoir of a spiritual journey that breaks through pain and heartbreak and leads to the rebirth of his major-league career. Josh Hamilton makes no excuses and places no blame on anyone other than himself. He takes responsibility for his poor decisions and believes his story can help millions who battle the same demons. "I have been given a platform to tell my story" he says. "I pray every night I am a good messenger." Hadn't read a book in 5 years, then the Rangers made it to the World Series... Bought this book and read the whole thing in a day and a half. Couldn't put it down. An inspiring, encouraging, and liberating story! Probably the greatest book I ever read. What a story. Couldn't put it down. Highly recommend.